The 2018-19 Wild: Extremely unlucky or just not very good? One theory: Maybe the Wild is getting plenty of chances but doesn’t have the right players to convert them? That would match the eye test and the ire of Wild fans. In sports (and in life), there is a tendency to seek answers to a variation on the question, “Is it better to be lucky or good?” In sports this plays out in attempts to quantify whether certain teams or players had a streak of luck that caused elevated performance or if they’re really just that good. I’d like to ask the opposite question of the 2018-19 Minnesota Wild: Is this team particularly unlucky or just not very good? Through various data points involving shot quality – both in terms of shots taken and shots allowed – Corsica Hockey derives the expected goals statistic. Since we have data on both offense and defense for all teams, it’s possible to determine expected goal differential – what you would expect a team’s goal differential to be based on the quality and quantity of shots it takes and gives up. Taking a look at this data during 5-on-5 play – a fair evaluation – we find that the Wild’s expected goal differential this season is plus-25.62 (144.06 goals scored and 118.43 goals allowed). That expected differential is fifth-best in the NHL. But the Wild’s actual 5-on-5 goal differential this season is minus-12 (133 scored, 145 allowed). Every other NHL team in the top 13 of expected goal differential this season has a 5-on-5 goal differential of at least plus-12. The Wild is a huge outlier. And the gap between the Wild’s actual 5-on-5 goals and expected goals is 37.62 goals – by far the largest negative margin in the NHL. Next-worst is Carolina at 28.4 goals fewer than expected. What that seems to indicate is that the Wild deserves a better outcome than it is getting this season, at least in 5-on-5 situations. Last year, for instance, the Wild’s expected goal differential in 5-on-5 situations was plus-19.75, fourth-best in the NHL. Its actual goal differential was close, at plus-16. The Wild finished with 101 points and made the playoffs. Here, though, it’s useful to examine how “expected goals” are calculated. Corsica uses several factors, including shot type, shot angle and shot distance but excludes “shooter talent not because it isn’t an important factor, but rather because I fear players may unfairly benefit or suffer from their linemates’ aptitude,” per a 2016 explanation by Emmanuel Perry. Maybe the Wild is getting plenty of chances but doesn’t have the right players to convert them? That would match the eye test and the ire of Wild fans. 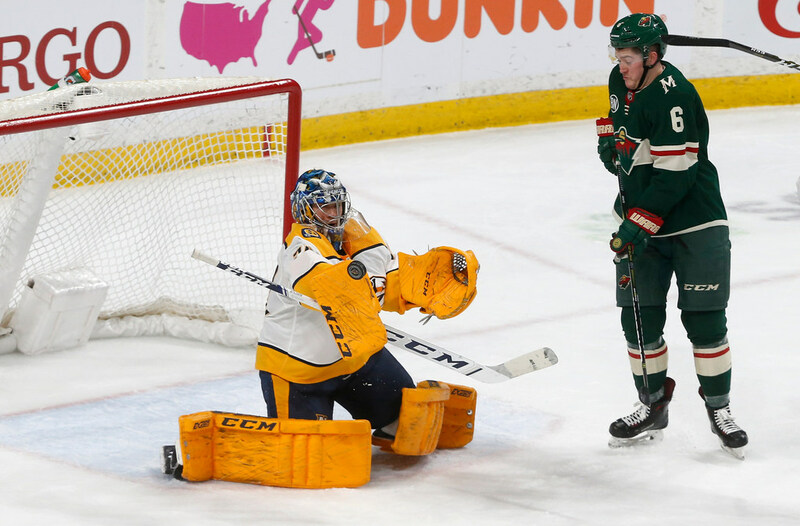 “That sort of epitomizes the way it was going and the season: getting chances to score and not burying them,” coach Bruce Boudreau said after the Wild’s 1-0 loss to Nashville on Monday, a game in which the Wild had 29 shots and several good chances but no goals. But most of the difference in the Wild’s expected vs. actual goal differential comes from goals allowed (minus-26.57) instead of goals scored (minus-11.05). That would imply the Wild’s goaltending is to blame, but there are things about shot type and shot quality – Was it a screen? Who was shooting the puck? – that aren’t clearly factored into the shot quality. And maybe what Corsica deems a quality shot differs from the Wild’s definition. What we do know is that if the Wild’s actual 5-on-5 goal differential was anywhere close to its expected goal differential, we’d be talking about a team headed to the postseason for a seventh consecutive season instead of one hanging by a thread in the chase. And like those strong teams that are probably best described as a combination of lucky and good, the Wild is probably best described as a duality: unlucky but also not very good. Or at least not good enough.